Myles Christian Turner (born March 24, 1996) is an American professional basketball player for the Indiana Pacers of the National Basketball Association (NBA). He played one season for the Texas Longhorns before declaring for the 2015 NBA draft and being selected by the Pacers with the 11th overall pick. Turner was born in Bedford, Texas to parents David and Mary Turner, and started playing basketball as a six-year-old. He attended Central Junior High School, and as a 6-foot-2-inch freshman, he led his team to 27 wins. Throughout high school, Turner played AAU basketball for the Texas Select team during the springs and summers to further develop himself and gain recognition as a player, participating in well known tournaments and camps such as the LeBron camp, the Nike Big Man Skills Academy, the NBPA Top 100 camp, Adidas Nations, and the Elite 24 invitational. Between his sophomore and junior year, Turner, then 6'7", broke his ankle during the first spring game of AAU play, hurting his chances of recruitment, but soon recovered and gained some 30 pounds through two-a-day weight training regimen to improve his game. In his junior year, after fully recovering, Turner averaged 15 points, 12 rebounds and eight blocks per game, leading Trinity to a 17–13 record and reaching the state playoffs for the first time in 10 years, and only the ninth time in school history dating back to the school's establishment in 1968. He also accumulated six triple-doubles. During the 2013 AAU summer circuit, Turner maintained his high level of production, leading his Texas Select team to the title at the 2013 Jayhawk Invitational in front of coaches from most of the Big 12 schools. Going into his senior year, Turner began garnering nationwide attention and becoming a highly sought after recruit for his athleticism, ball handling, shooting ability, and natural shot blocking ability for someone of his height. He solidified that by finishing out his high school career with 18.1 points, 12.2 rebounds, 3.5 assists and 6.8 blocks per game, leading the Trojans to a 24–7 record. After finishing off his senior year, Turner was one of the last highly sought after recruits left that were uncommitted. He was rated a five-star prospect by many sites including Rivals.com and several more college basketball analysts as well as being considered the No. 2 center in the nation behind Jahlil Okafor. Originally going into his senior year in fall of 2013, Turner had already accumulated 60 various offers, but by his senior year, the list was narrowed down to Texas, Kansas, Duke, Arizona, Kentucky, Ohio State and Oklahoma State. On April 30, 2014, live on ESPNU's Recruiting Insider, Turner formally announced his commitment to play basketball for the University of Texas. Turner took part in the 2014 McDonald's All-American Boys Game, in which he recorded seven points and seven rebounds. He also represented the United States in the 2014 FIBA Americas Under-18 Championship, helping the country win a gold medal. "Texas 2014 Basketball Commitments". Rivals.com. Retrieved June 23, 2015. "2014 Texas Basketball Commits". Scout.com. Retrieved June 23, 2015. "ESPN". ESPN.com. Retrieved June 23, 2015. "Scout.com Team Recruiting Rankings". Scout.com. Retrieved June 23, 2015. "2014 Team Ranking". Rivals.com. Retrieved June 23, 2015. As a freshman at Texas in 2014–15, Turner averaged 10.1 points, 6.5 rebounds and 2.6 blocks per game, earning 2015 Big 12 Freshman of the Year honors. On March 30, 2015, Turner declared for the NBA draft, forgoing his final three years of college eligibility. In June 2015, Turner said, "The decision wasn't really that hard because I knew I would be picked pretty high, so I knew this was my opportunity to go." Turner was selected by the Indiana Pacers with the 11th overall pick in the 2015 NBA draft. He missed 21 games between November 13 and December 28 of his rookie season after undergoing surgery to repair a fracture in his left thumb. On January 22, 2016, he scored a career-high 31 points in a 122–110 loss to the Golden State Warriors. On March 3, he was named Eastern Conference Rookie of the Month for February after ranking third among East first-year players in scoring (13.4 ppg), rebounding (6.6 rpg) and minutes (29.8 mpg) during the month. On March 24, he recorded 24 points and a career-high 16 rebounds in a 92–84 win over the New Orleans Pelicans. 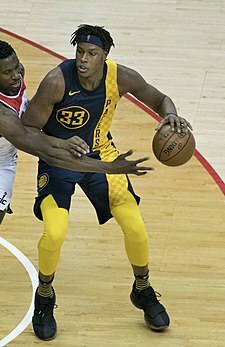 Turner helped the Pacers reach to the playoffs as the seventh seed in the Eastern Conference with a 45–37 record, where they lost 4–3 to the Toronto Raptors in the first round. At the season's end, he earned NBA All-Rookie Second Team honors. In the Pacers' season opener on October 26, 2016, Turner recorded 30 points and a career high-tying 16 rebounds in a 130–121 overtime win over the Dallas Mavericks. On December 15, he scored 26 points in a 102–95 loss to the New Orleans Pelicans. On January 5, 2017, he recorded 25 points and 15 rebounds in a 121–109 win over the Brooklyn Nets. On March 26, he had 17 points and tied a career high with 16 rebounds in a 107–94 win over the Philadelphia 76ers. Prior to the start of the 2017–18 season, Turner was elected team captain. In the Pacers' season opener on October 18, 2017, Turner had 21 points and 14 rebounds in a 140–131 win over the Brooklyn Nets. He missed the next eight games due to a concussion. On November 19, he scored a season-high 25 points against Miami Heat. Turner missed nine games in January with an injured right elbow. On March 13, he tied his season high with 25 points against the Philadelphia 76ers. On October 15, 2018, Turner signed a four-year, $72 million contract extension with the Pacers. On October 29, in a 103–93 loss to the Portland Trail Blazers, Turner had three blocks to tie James Edwards (391) for No. 8 on the franchise's NBA career list. On December 10, he recorded a then season-high 26 points and 12 rebounds in a 109–101 win over the Washington Wizards. On December 23, he had 18 points and a career-high 17 rebounds in a 105–89 win over the Wizards. On January 31, he scored 27 points in a 107–100 loss to the Orlando Magic. On March 5, he had a career-high seven blocks in a 105–96 win over the Chicago Bulls. On March 18, he scored a season-high 28 points in a 106–98 loss to the Trail Blazers. ^ a b Helwagen, Steven (October 22, 2013). "Schools Turning Up Heat For Turner". 247sports.com. Retrieved June 24, 2015. ^ "USA Basketball: Myles Turner". USA Basketball. Retrieved June 23, 2015. ^ a b c Smith, Corbett (February 2, 2014). "Euless Trinity's Myles Turner is nation's most sought-after recruit, yet late bloomer still developing". dallasnews.com. Dallas Morning News. Retrieved June 24, 2015. ^ a b Borzello, Jeff (July 31, 2013). "Myles Turner stakes claim as biggest riser of the summer". CBS Sports. Retrieved June 24, 2015. ^ Mecalf, Myron (March 8, 2015). "Being Texas' Myles Turner isn't easy". espn.com. ESPN. Retrieved June 24, 2015. ^ "Myles Turner – The Rise Of A Star". prepforce.com. August 5, 2013. Retrieved June 24, 2015. ^ Bedore, Gary (April 30, 2014). "Texas prep Myles Turner turning heads". Lawrence Journal-World. Retrieved June 24, 2015. ^ Borzello, Jeff. "Breakdown: Top-five senior Myles Turner commits to Texas". CBSsports.com. CBS Sports. Retrieved June 24, 2015. ^ "Myles Turner". 247Sports.com. CBSSports.com. Retrieved June 30, 2014. ^ "Myles Turner". Yahoo! Sports. Rivals. Retrieved June 30, 2014. ^ King, Jason (February 12, 2015). "King's Court: Top Unsigned Recruit Myles Turner Opens Up on College Options". bleacherreport.com. Bleacher Report. Retrieved June 24, 2015. ^ Biancardi, Paul (April 30, 2014). "Myles Turner chooses Texas". espn.com. ESPN. Retrieved June 24, 2015. ^ Zimmerman, Kevin. "2014 McDonald's All-American Game: Jahlil Okafor, Myles Turner lead rosters". SBNation.com. Retrieved June 30, 2014. ^ Goodman, Jeff (March 30, 2015). "Myles Turner to go pro". ESPN. Retrieved March 31, 2015. ^ Dwain, Price (June 23, 2015). "Myles Turner's NBA dream will soon become reality". Fort Worth Star-Telegram. Retrieved June 24, 2015. ^ "Pacers Add Turner, Young in 2015 Draft". NBA.com. June 26, 2015. Retrieved June 26, 2015. ^ "Wolves' Towns, Knicks' Porzingis lead 2015-16 NBA All-Rookie teams". NBA.com. May 19, 2016. Retrieved May 19, 2016. ^ "Davis, Hield lift Pelicans past Pacers, 102-95". ESPN.com. December 15, 2016. Retrieved March 5, 2019. ^ "Teague, Turner carry Pacers past Nets 121-109 for 4th in row". ESPN.com. January 5, 2017. Retrieved January 6, 2017. ^ "Turner leads Pacers to 107-94 victory over 76ers". ESPN.com. March 26, 2017. Retrieved March 26, 2017. ^ a b "Revamped Pacers rely on new faces to cut down Nets 140-131". ESPN.com. October 18, 2017. Retrieved October 18, 2017. ^ "Redick's 3s, Simmons' triple-double lead 76ers over Pacers". ESPN.com. November 3, 2017. Retrieved March 5, 2019. Turner hadn't played since sustaining a concussion in Indiana's season-opening win against Brooklyn on Oct. 18. ^ a b "Myles Turner 2017-18 Game Log". Basketball-Reference.com. Retrieved March 5, 2019. ^ "Pacers use late-game magic to rally past Orlando 114-112". ESPN.com. January 27, 2018. Retrieved January 28, 2018. ^ "Pacers Sign Myles Turner to Contract Extension". NBA.com. October 15, 2018. Retrieved October 15, 2018. ^ Wojnarowski, Adrian (October 15, 2018). "Myles Turner agrees to 4-year, $72M extension with Pacers". ESPN.com. Retrieved October 15, 2018. ^ "Trail Blazers use 2nd-half charge to get past Pacers 103-93". ESPN.com. October 29, 2018. Retrieved October 29, 2018. ^ "Turner helps Pacers escape with 109-101 victory over Wizards". ESPN.com. December 10, 2018. Retrieved December 10, 2018. ^ "Turner, Pacers beat up well-worn Wizards 105-89". ESPN.com. December 23, 2018. Retrieved December 24, 2018. ^ "Ross scores 30 as Magic hand Pacers 4th straight loss". ESPN.com. January 31, 2019. Retrieved March 5, 2019. ^ "Bogdanovic leads late charge to help Pacers sweep past Bulls". ESPN.com. March 5, 2019. Retrieved March 5, 2019. ^ "Blazers prevent Pacers from clinching with 106-98 win". ESPN.com. March 18, 2019. Retrieved March 19, 2019. Wikimedia Commons has media related to Myles Turner. This page was last edited on 24 April 2019, at 17:35 (UTC).